*On Monday mornings, I make a huge patch of pancakes and what we don’t eat that morning, is frozen for Spunkster to eat (because he eats them almost every morning) and for the other mornings where pancakes are on the menu. **These are homemade burritos, sometimes, when I am feeling very industrious, I will make a ton and freeze them. 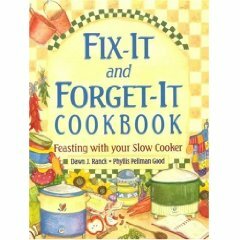 <–* This denotes a recipe found in the cookbook Fix It and Forget It. I highly recommend it! The slow cooker is in use at the house pretty much everyday. This book is full of tasty recipes that I use again and again. This entry was posted on Sunday, June 21st, 2009 at 9:54 am	and tagged with Weekly Menu You can follow any responses to this entry through the RSS 2.0 feed. I love my Crock Pot. I have been looking for new recipes. Thanks for recommending this book. Have you seen the blog where a woman made a resolution to use her crock pot every day for a year? I am trying recipes from it.